Do I need a permit to carry concealed in Maine? No. On October 15, 2015, Maine’s Constitutional Carry law went into effect. Residents and non-residents that are legally allowed to possess a firearms and are at least 21 years old are allowed to carry concealed in Maine. Active Military and Honorably Discharged Veterans can carry at the age of 18. Does Maine issue concealed carry permits? Maine is a Shall Issue State and still issues Concealed Handgun Permits to residents of Maine and non-residents. Even though they allow anyone legally allowed to possess a firearm to carry concealed, they still issue concealed carry permits. To apply, check the Town Listing for the city or town you live in before sending your application in to the State Police. If you do not see your city or town on the list then you will need to contact your respective city\town office for more information on how to apply for a concealed handgun permit. If you live in a city\town that has their own police department you must go through them to obtain a concealed handgun permit. Who issues Maine Concealed Handgun Permits? Maine Concealed Handgun Permits usually issued by the State Police. Check the Town Listing for the city or town you live in before sending your application in to the State Police. If you do not see your city or town on the list then you will need to contact your respective city\town office for more information on how to apply for a concealed handgun permit. If you live in a city\town that has their own police department you must go through them to obtain a concealed handgun permit. Are background checks required for a Maine Concealed Handgun Permit? Yes, there is a background check when apply for a Maine Concealed Handgun Permit but it is not a NICS check. Does having a Maine Concealed Handgun Permit exempt you from the background check when purchasing a firearm Maine? No, the background check is conducted is not a NICS check so having a Maine Concealed Handgun Permit does not exempt you from the background check when purchasing a firearm. 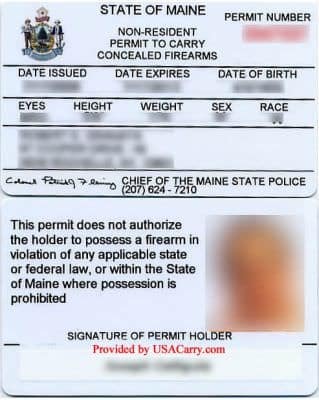 How long is a Maine Concealed Handgun Permit valid for? Maine Concealed Handgun Permits are valid for 4 years. What is the processing time for a Maine Concealed Handgun Permit? The processing time for new Maine Concealed Handgun Permits is within 30 days for Maine Residents that have been a resident for 5 or more years. For residents that have been a resident for less than 5 years and non-residents the processing time is within 60 days. How much does a Maine Concealed Handgun Permit cost? The fee for a new Maine Concealed Handgun Permit is $35. Renewal licenses cost $20. The cost is $2 for a duplicate permit, change of address or name change. What are the requirements for a Maine Concealed Handgun Permit? Repealed, P.L. 1993, c. 368 § 4. Is there a formal charging instrument now pending against you in this State for a crime under the laws of this State that is punishable by imprisonment for a term of one year or more? Is there a formal charging instrument now pending against you in any federal court for a crime under the laws of the United States that is punishable by imprisonment for a term exceeding one year? Is there a formal charging instrument now pending against you in another state for a crime that, under the laws of that state, is punishable by a term of imprisonment exceeding one year? If your answer to the question in division (d) is “yes,” is that charged crime classified under the laws of that state as a misdemeanor punishable by a term of imprisonment of 2 years or less? Is there a formal charging instrument pending against you in another state for a crime punishable in that state by a term of imprisonment of 2 years or less and classified by that state as a misdemeanor, but that is substantially similar to a crime that under the laws of this State is punishable by imprisonment for a term of one year or more? Is there a formal charging instrument now pending against you under the laws of the United States, this State or any other state or the Passamaquoddy Tribe or Penobscot Nation in a proceeding in which the prosecuting authority has pleaded that you committed the crime with the use of a firearm against a person or with the use of a dangerous weapon as defined in Title 17-A, section 2, subsection 9, paragraph A? Is there a formal charging instrument now pending against you in this or any other jurisdiction for a juvenile offense that, if committed by an adult, would be a crime described in division (b), (c), (d) or (f) and involves bodily injury or threatened bodily injury against another person? Is there a formal charging instrument now pending against you in this or any other jurisdiction for a juvenile offense that, if committed by an adult, would be a crime described in division (g)? Is there a formal charging instrument now pending against you in this or any other jurisdiction for a juvenile offense that, if committed by an adult, would be a crime described in division (b), (c), (d) or (f), but does not involve bodily injury or threatened bodily injury against another person? Have you ever been convicted of committing or found not criminally responsible by reason of mental disease or defect [insanity] of committing a crime described in division (b), (c), (f) or (g)? Have you ever been convicted of committing or found not criminally responsible by reason of mental disease or defect [insanity] of committing a crime described in division (d)? If your answer to the question in division (l) is “yes,” was that crime classified under the laws of that state as a misdemeanor punishable by a term of imprisonment of 2 years or less? Have you ever been adjudicated as having committed a juvenile offense described in division (h) or (i)? Have you ever been adjudicated as having committed a juvenile offense described in division (j)? Are you currently subject to an order of a Maine court or an order of a court of the United States or another state, territory, commonwealth or tribe that restrains you from harassing, stalking or threatening your intimate partner, as defined in 18 United States Code, Section 921(a), or a child of your intimate partner, or from engaging in other conduct that would place your intimate partner in reasonable fear of bodily injury to that intimate partner or the child? Are you a drug abuser, drug addict or drug dependent person? Do you have a mental disorder that causes you to be potentially dangerous to yourself or others? Have you been adjudicated to be an incapacitated person pursuant to Title 18-A, Article 5 [Probate Code; Protection of persons under disability and their property], Parts 3 and 4 and not had that designation removed by an order under Title 18-A, section 5-307, subsection (b) [Termination of incapacity]? Have you been dishonorably discharged from the military forces within the past 5 years? Are you an illegal alien? Have you been convicted in a Maine court of a violation of Title 17-A, section 1057 [Possession of firearms in an establishment licensed for onpremises consumption of liquor] within the past 5 years? Have you been adjudicated in a Maine court within the past 5 years as having committed a juvenile offense involving conduct that, if committed by an adult, would be a violation of Title 17-A, section 1057 [Possession of firearms in an establishment licensed for on-premises consumption of liquor]? To your knowledge, have you been the subject of an investigation by any law enforcement agency within the past 5 years regarding the alleged abuse by you of family or household members? Have you been convicted in any jurisdiction within the past 5 years of 3 or more crimes punishable by a term of imprisonment of less than one year or of crimes classified under the laws of a state as a misdemeanor and punishable by a term of imprisonment of 2 years or less? Have you been adjudicated in any jurisdiction within the past 5 years to have committed 3 or more juvenile offenses described in division (o)? To your knowledge, have you engaged within the past 5 years in reckless or negligent conduct that has been the subject of an investigation by a governmental entity? Have you been convicted in a Maine court within the past 5 years of any Title 17-A, chapter 45 drug crime? Have you been adjudicated in a Maine court within the past 5 years as having committed a juvenile offense involving conduct that, if committed by an adult, would have been a violation of Title 17-A, chapter 45 [Criminal Code, Drugs]? Have you been adjudged in a Maine court to have committed the civil violation of possession of a useable amount of marijuana, butyl nitrite or isobutyl nitrite in violation of Title 22, section 2383 within the past 5 years? Demonstrates to the issuing authority a knowledge of handgun safety. The applicant may fully satisfy this requirement by submitting to the issuing authority, through documentation in accordance with this subparagraph, proof that the applicant has within 5 years prior to the date of application completed a course that included handgun safety offered by or under the supervision of a federal, state, county or municipal law enforcement agency or a firearms instructor certified by a private firearms association recognized as knowledgeable in matters of handgun safety by the issuing authority or by the state in which the course was taken. A course completion certificate or other document, or a photocopy, is sufficient if it recites or otherwise demonstrates that the course meets all of the requirements of this subparagraph. As an alternative way of fully satisfying this requirement, an applicant may personally demonstrate knowledge of handgun safety to an issuing authority, if the issuing authority is willing to evaluate an applicant’s personal demonstration of such knowledge. The issuing authority is not required to offer this 2nd option. 10/16/2015 – Format updated along with all information.